When Elder Juan Alberto Uceda Andrade began courting Maria Isabel Bendezú﻿—the woman he would eventually marry﻿—he knew she was someone special. Both had converted to the Church as youth, and both had served missions in their native country, Peru. The couple were married in the São Paulo Brazil Temple on April 13, 1979. They are the parents of five children. Elder Uceda was born in July 1953 in Lima, Peru, to Juan Jose Uceda Perez and Ines Andrade Uceda. After joining the Church in 1972, Elder Uceda studied accounting and public relations at Jose Carlos Mariátegui Institute in Lima. He also studied business administration at the Centro Andino de G.E. Institute and earned a bachelor’s degree in public relations from San Luis Gonzaga University. Elder Uceda has worked in the Church Educational System as area director for Peru and Bolivia. In 2003 he moved from Peru to New Jersey, USA, to help his father develop an educational and language training business. 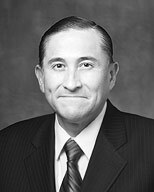 In addition to his missionary service, Elder Uceda has served as a high councilor, bishop, stake president, president of the Lima Peru North Mission, and Area Seventy. He now serves in the First Quorum of the Seventy.